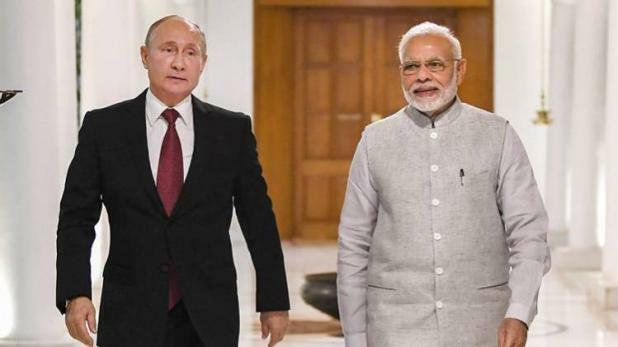 Good news has come from Russia for Prime Minister Narendra Modi who is facing the opposition attacks during the Lok Sabha elections. Narendra Modi has received another honor of the world. Russia has decided to give its highest civilian honor - St. Andrews award to PM Modi. Russia's President Vladimir Putin has also approved this. Let the Prime Minister get many international honors in the last few days. Recently, the UAE had also declared him the award for a fatal award. The Russian Embassy has said in a statement: "On April 12 Prime Minister Narendra Modi has been declared the honorary citizen of St. Andrew, Russia." This honor will be given to Prime Minister Narendra Modi to strengthen the relationship between India and Russia. Has been given for. Prime Minister Modi thanked Russia for giving the highest civilian honor. He said thank you to the people of Russia and President Putin. Prime Minister Modi said, "Thank you for this dignified award. I express gratitude to the Putin of Russia and the people of Russia. The foundation of Russia and India's friendship is very deep. The future of our partnership is very bright. Cooperation between the two nations will bring unexpected results to our citizens. Be the first Indian Prime Minister to get the award. Earlier this honor was also received by Chinese President Xi Jinping. In February of this year, South Korea also awarded the Seoul Peace Prize to the Prime Minister. Prime Minister Modi who was honored with this award was the first Indian person. Significantly, opposition parties in India have consistently been targeting Prime Minister Narendra Modi for his foreign visits. At the same time, PM Modi himself and External Affairs Minister Sushma Swaraj declares her government's foreign policy as historic. Meanwhile, getting another award can prove to be good news for the PM.